1 more GOLD for Jamaica, 2 Silvers and a Bronze! Am Update & Tonight’s Schedule! 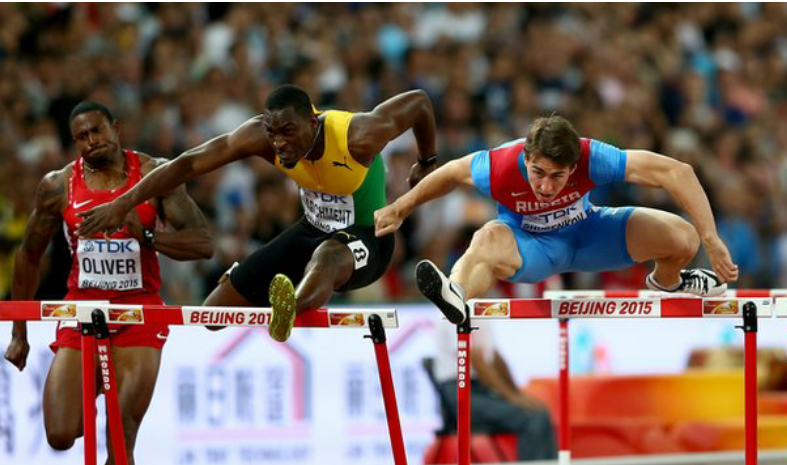 Friday am Highlights from Beijing! Jamaica’s Champion, Danielle Williams held off World Leader, Sharika Nelvis from the USA with a PB of 12.58. The fastest Semi Final. Nelvis ran 12.59. USA’s Dawn Harper-Nelson crashed and burned from about the 2nd or 3rd hurdle. Drama. USA’s collegiate Champion, Kendra Harrison false started. She went way out of the blocks.They fantastic 4 are now down to 2. GB’s Confident Tiffany Porter blazed through easily with a tine of 12.62 ahead of Cindy Roleder of Germany. 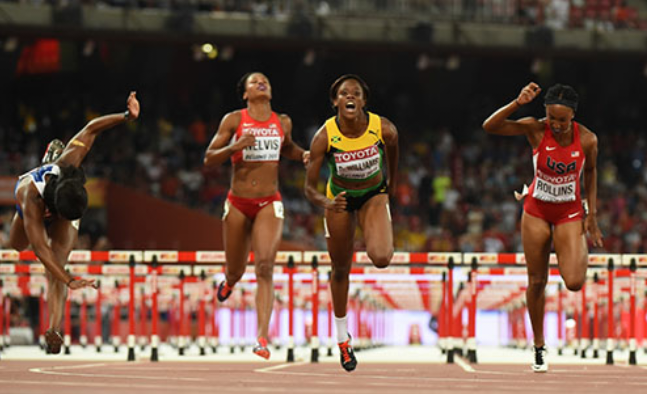 Jamaica’s Kimberly Laing was way behind so failed to qualify. USA’s Defending Champion, Brianna Rollins won in 12.71 and Danielle’s sister, Shermaine had a bad start and was behind but persevered and powered through to come 2nd and qualify. Well done Shermaine. WOMEN’S 200M FINALS! Suga called it! Dafne Schippers runs a Championship record of 21.63! She passed Elaine Thompson at the end. Elaine ran 21.66, her PB, also faster than the Championship record, making her the second fastest ever at World Champs! BUT you can never count out the veteran VCB! Veronica Campbell-Brown was ahead for most of the race. She ran the race of her life in a young A field finishing 3rd SUB 22 – 21.97. Silver and Bronze for Jamaica! USA’s McGrone came 4th and GB’s Dina Asher Smith 5th. Our Sherone Simpson finished last but with her Season’s best. USA’s Bartoletta has made the right move to stop running. She has won Gold in the Women’s Long Jump final with a huge jump of 7.14, ahead of favourite GB’s Proctor who won silver with 7.07. The Russian wins! Oliver hit the first hurdle badly. Sergey Shubenkov won in 19.98! Hansle Parchment of Jamaica won silver after a horrible start but persevered and finished fast. USA’s Merritt won Bronze. France’s Martinot-Lagarde and Bascou came 4th and 5th. Ja’s McLeoud came 6th. Once he stops hitting hurdles he can win. 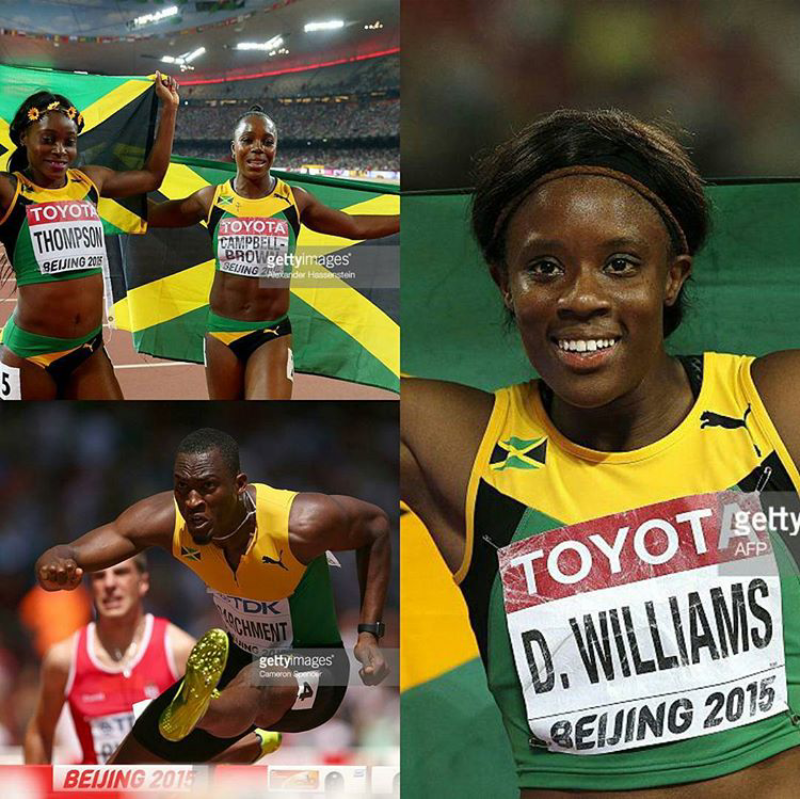 DANIELLE WILLIAMS WINS GOLD FOR JAMAICA IN THE 100M HURDLES FINAL! WOW! 12.57 PB. What were the odds?! 12.5 for the win and 8.5 if she placed in top 3. Don’t you wish you had that tip. But after she beat USA’s WL Nelvis this am in the semi final she was in good standing. The German, Roleder wins silver and Talay! from Belarus Bronze edging out GB and USA!